That's the reviews finished for the year. We'll be back on or around the third of January 2017 - enjoy the holiday! 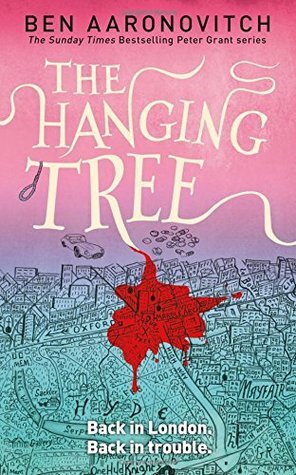 The Hanging Tree is the sixth in Ben Aaronovitch’s “PC Peter Grant” series. I’ve enjoyed the series until now; though some entries have felt better crafted than others, the appeal of a supernatural mystery, cloaked in British history, and wrapped in some wonderfully funny, clever dialogue, has kept me turning pages. 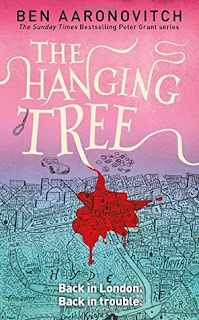 The Hanging Tree doubles down on this formula, and I think it’s the better for it – after experimenting with trips out to the ‘countryside’ in the previous book, we’re now back in the heart of dirty, thriving, vibrant London again. This time our protagonist, PC Peter Grant, is exploring the lives of the rich, famous, and, er…dead. This is a whole other London to the creaking tower blocks we saw in, for example, Broken Homes. Here the streets are calm, the gardens well manicured – and the houses are merely the tip of an iceberg – exclusive addresses squatting over cavernous basements, bastions of classic wealth with sprawling facilities below. There’s a scent or privilege in the air, a sense of expensive suits and ruthlessness. Into this world steps PC Grant, a man with an unfortunate penchant for making enemies, a certain wry charm, and the ability to throw fireballs, as long as he’s filled out the paperwork first. That said, they’re of less utility against a high powered team of lawyers, and it’s great to see Peter being put once more out of his element; in previous instalments this was tied to his understanding of magic; with that steadily improving, he’s now finding himself in environments, social and physical, which are somewhat less than familiar. Still, it’s nice to watch his long running character arc continue here – as a man slowly rising to competence in thaumaturgy, whilst determined to inquire into how it actually works. He’s starting to feel, if not more sedate, perhaps more settled – admittedly, his steady girlfriend is a river goddess, and his boss once blew up a Tiger tank with his bare hands, but Peter is entering, if not a routine, at least a steady state, a way of thinking about himself and the world which moves it from “sprinting to stay in one place” to genuine progress of comprehension. In this he’s ably assisted by the aforementioned girlfriend, Beverly Brook, herself a creature of winsome charm and, just possibly, a bit more of an agenda. They’re both rather good at living in the moment, but there’s a creeping sense that they both are starting to look into the future, and wor out exactly what perils that may hold. Alongside these two is, of course, Nightingale – Grant’s mentor in the world of magic. We see a bit more of Nightingale here, the slow revelation of the shattering of magic in the 1940’s becoming ever clearer. Some of what defines Nightingale is pushed around in the narrative subtext – though he remains a man of startlingly hidden depths. On the other hand, he’s also a dab hand at driving a nice car very fast, and occasionally bringing out the Big Magic for supernatural villains. I won’t spoil those, but suffice to say the entire book is full of plots and counterplots, schemes sliding past each other in the night, entangling, and throwing together some rather unlikely pairings. Our villains can even, to some degree, be seen as sympathetic – even when they’re equally atrocious. Where the villainy here is extremely well masked, we do get the opportunity to see the sterling supporting cast return – Seawoll, Guleed, and a great many others. There’s a sense that the Folly, the home of British Wizardry, is slowly flexing its muscles again, adding staff to an organisation atrophied down to one man. On the other hand, as has been delicately hinted in earlier instalments, there’s also the possibility of interaction with other magical traditions = which always have the opportunity to go entertainingly sideways. The plot – well, it’s one part murder mystery, one part action caper, with a side order of personal introspection. There’s a little bit of a slow burn at the start, as the initial investigation comes together – but after that, it paces along nicely. The twists and turns are largely well done, the rising tension in the investigation keeping you turning the pages, and the occasional displays of magic are alternately intriguing and explosively impressive. There’s a lot of questions thrown out in the course of the text – and a few of the larger ones from earlier books at least start to have been answered. Is it worth reading? Well, if you’re coming to the series fresh, I’d recommend going back to the beginning, to Rivers of London (MidnightRiot in the US). But if you’re already a fan, then yes – this entry in the series is a barnstormer, and a thoroughly enjoyable read. 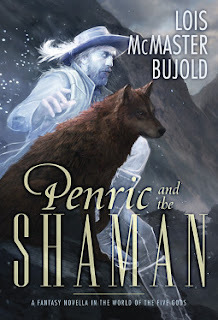 “Penric and the Shaman” is a fantasy novella by Lois McMaster Bujold. As longer term readers know, I enjoy Bujold’s sci-fi “Vorkosigan Saga” series immensely, so came to this novella as a means of experimenting with her sojourn into fantasy; not many writers seem to work in both genres, and fewer do so successfully. Penric and the Shaman, fortunately, is rather good. The world of the novella is an interesting one; there’s hints of a monarchical style system of rule, and suggestions scattered through which suggest a feudal fealty style arrangement between lords and labourers. But whilst there’s a little time spent in urban environments, the majority is out in the countryside – well, mostly, the mountainside. The focal point is a village almost buried in a mountain range, where it seems the chief industries are hunting, fishing, and getting up to inconveniently unorthodox magic. But the crisp air of the peaks pours off the page, and the sense of a close community, tied by isolation, has a warmth all of its own which shines through here. On the point of magic – there’s a fair bit of this floating around. For those of you with a penchant for magic systems – well, it seems that this is a world where individuals are still trying to find own exactly how otherworldly effects can be generated. So there’s some systematising, but mostly, the reader is at least as much in the dark as the characters. There’s the Shaman of the title – heir to a tradition which seems to involve bonding with animals, ritual focus and astral projection – amongst other things. Then there’s the demons – which seem to be creatures with a nature of destruction, which pass from host to host, occasionally set things on fire, and also have something of a talent for sarcasm. There’s a melange of styles here, but they’ve been wrapped in cultural signifiers, and they’re separated enough to keep them clear to the reader – and the descriptions of the Shamanic magic are particularly well done, drawing the reader out into the astral alongside the practicioner. The characters – well, I suppose the protagonist is the Penric of the title, though he shares equal time with a church investigator and a shaman. Penric is smooth, with an ineffable charm. He’s got a layer of class around him, a sense of style which the narrative slides over, letting it shine through at odd moments. He’s clever, evidenced by his investigative skills, and seems to do well at interpersonal interaction. One of the small joys is listening to the conversations he has with his demon, Desdemona – an inner dialogue which is equal parts smart-arse, intellectual debate, and mentoring. Though who exactly is teaching whom seems to vary. In any event, Penric is a vital, funny, fascinating figure – and one whom I’d like to see more of. He’s followed by the investigator for the church – a dogged man, in search of a murder suspect. This is an individual with a nose for the truth, which also isn’t especially clogged with dogmatism. As a mid-level functionary, with some arms training and an inquiring mind, I found he worked well as a conduit for my interests – spending much of the book either trying to wok out what exactly was going on, or why he was following Penric around at all. Between moments of brusque competence, however, there are a few searing lines of discussion between them, revealing a man of dedication, unwilling to let the innocent suffer the consequences of crime, and aware fo the extremes to which terrified people may go. The Shaman, the last of the triad, is something else entirely. I won’t get into his role now, for fear of spoilers. But this is an individual living in his own torments. There’s a personal, moral conflict here, and the depths of the soul are excavated in the narrative – to great effect, I might add. The plot – well, it’s a murder mystery, and a chase, and a personal journey, all in one. The dialogue absolutely crackles with energy, and if there’s not much in the way of fast-paced swordfights, there’s a lot of sparring with words – and a fair bit of spectacular thaumaturgy. Watching Penric and his investigator dig into the circumstances of a murder, trying to piece together what happened and why, and then chase down the putative culprit, is compelling and tense reading – as are the revelations in what follows. Is it worth reading? Well, I certainly enjoyed it. It’s a story about people in the main, about what drives them, what keeps them together, about what they’ll sacrifice, and about what drives people to commit small atrocities or acts of heroism. This isn’t a narrative about the grand sweep of armies – but it’s charming, and has a penetrative insight which makes it a great read, in a certain frame of mind. Mirror Dance is next in my ongoing retrospective on Lois McMaster Bujold’s ‘Vorkosigan saga’ series. The previous entry was ‘Brothers in Arms’, which was a perfectly reasonable sci-fi thriller, but didn’t hit the high notes of ‘Barrayar’ or ‘Cetaganda’. Brothers in Arms feels like a sci-fi action movie for many parts, rather than the slower burning thriller of its predecessor. But there’s also some interesting meditations on identity – almost expected at this point - guilt, loyalty and family. Mark, Mile’s clone-brother is one of the key viewpoints of this novel, after a brief role as a tortured antagonist in the previous book. Here he is, ironically, determined to live up to the image of Miles built up by his guardians. Mark is incredibly insecure in his feeling of uniqueness – not surprising given he was created entirely to mirror Miles. Here, Mark acts decisively in an effort to establish both difference and worth. Watching him move through the text, taking hold of assets and turning them to his own purpose is, well, reminiscent of Miles. They both have that force fo personality leaping off of the page – but what Mark does not have is a sense of restraint, of history, and of the cost of his decisions. Over the course of the narrative, he is acquainted with all of these things. Men die from his orders, under pretences or otherwise, and the agony of command burns into him. Where Miles has the Vor to act as his final ethical framework, , Mark has only Miles, and the examples of his less than effective handlers in earlier life. But Mark slowly learns responsibility, and becomes intimately acquainted with survivors’ guilt. Whilst determined to realise his goals, he becomes increasingly aware of the cost of his actions, in lives and materiel. He also starts to come around to the idea of Miles as family. There’s a wonderful contradiction here, as Mark seeks to emulate Miles for his virtues, whilst simultaneously seeking to differentiate them from each other – but without sliding into psychosis. Bujold shows us a portrayal of a personality in balance – much as with Miles himself in Brothers In Arms – and watching Msrk teeter on the knife edge of sanity feels both entirely real and deeply harrowing. Miles feels like more of a silent partner for much of the text, in contrast to his more energetic appearances in previous books. In this case, he’s working to pick up and deal with the mess his clone is making – not yet entirely sure what Mark is doing, or for whom. Miles’ cool confidence, both in command and under fire, is a start contrast to Mark’s well-meaning but often naïve or ineffectual efforts – but Miles himself is out of view for what feels like a lot of the text, though his lack of presence, in itself, helps to drive the story forward. The story mostly takes place around Jackson’s Whole. Earlier instalments have discussed this purported hive of scum and villainy at length, and we’ve even had a few visits there in other tales. But this is an opportunity to see the Whole laid bare – a society where everything, from flesh to jurisprudence, is for sale. Discussions around how much one might need to pay to ransom a captive are a delightful insight into the While’s legal system – where those with the gold quite literally make the rules. Bujold shows us the highs and lows of an economy effectively run by criminal gangs – the cutting edge research being done, the luxurious lifestyles of the corporate leaders, the shark-tank feel of the society that they’ve constructed. The Barons of Jackson’s Whole are a motley cast of moral reprobates, moving from the charmingly unpleasant toward the actively sociopathic. They are, to coin a phrase, mad, bad, and dangerous to know. But they also steal the scenes they’re in – from the chilly Baron Fell through to his rival, the driven and devious Baron Ryoval, they’re compelling figures, recognisably human in their intimacies, but also recognisably awful. The plot – well, there’s a lot going on. Some early action scenes step up the pace nicely, and give an almost cinematic feel. They’re followed by some more introspective scenes of investigation, with slowly ratcheting tension which explodes very satisfyingly near the close. This is a book that isn’t afraid to explore large themes – about the inevitability of death, and the changing nature of mortality, and about how an individual can define themselves as for or against both external and internal pressures. It’s a clever narrative, with interesting things to say – as well as a fair bit of fast-paced action – on which basis, I’d recommend giving it a try. Behind Her Eyes is a standalone novel from Sarah Pinborough, whose cracking “13 Minutes” we reviewed and said rather nice things about last year. 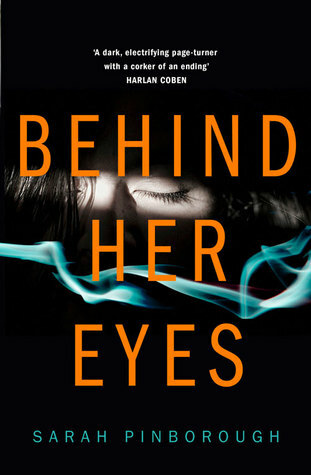 It’s a well honed psychological thriller – amongst other things. This is, at heart, a novel about people – in particular about the loves and hatreds, and about the secrets and lies which bind people together as thoroughly, or even more so, than genuine affection. At the same time, the narrative examines the way those links are shaped by, and impact upon, the people that create them. The core focus of the text is on the series of relationships between Louise, a single mother, struggling through her day job as an assistant at a medical practice, David, the newest doctor in that practice – and Adele, David’s wife. Louise, crucially, is given to us as a point of view character, and we share in the mundane and familiar aspects of her life – a love for her son, an effort to put on a good front before her ex-husband, a desire to be both more and less than she is. Louise is familiar, or at least comfortable to walk the narrative alongside. To be sure, she has character flaws – a tendency to impulsiveness, for example – but overall, she’s an intelligent woman, shaped by circumstances to have what feels in some ways a very claustrophobic life, stuck in a rut after a divorce, caring for her son between holidays, having the odd glass of wine after dinner, and never quite able to reach out for something more. David, the new doctor, is the one of the triad we see least – his motivations and goals cloaked from the reader. He’s a man capable of showing both infernal coolness, and great affection. It seems like there’s something haunting the man, a past not quite spoken of. He’s the bridge between Louise and Adele, his wife – and the mystery of what ties him to Adele, what strange rites bind them together, is at the crux of the mystery. David is the third party, seen from the vantage of the others, but perhaps not wholly understood. By turns he feels humane, warm and affectionate – and a distant force of nature, a force of pent up rage and potential violence. It’s to Pinborough’s credit that she makes both sides of the man feel as plausible, as likely, as the other. The third of the triad is Adele, David’s wife, who befriends Louise. Her segments are both revealing and obfuscated, if that’s possible. Adele is sharp eyed and sharp minded, an individual with a laser like focus, and a clear affection for her husband. That said, she’s also somewhere between terrified and damned – watching her mind race, picking up threads that tie to Louise and David, linking them together and trying to shift them to her own needs. Adele is clearly damaged, dangerous, or both but damaged by whom, or dangerous to whom is another matter. The setting feels, perhaps intentionally, claustrophobic – and largely settled around urban environs. Still, the atmosphere is sinister, if we’re not entirely sure why. There’s scenes in Louise’s cramped, slightly decrepit flat. Here’s the scent of genteel poverty, of old furniture and luxuries put off in the name of necessity – a feeling of work and honesty, laced with regrets and perhaps, just perhaps a tinge of hope. By contrast, Adele and David have a larger home, filled with unspoken accusations and a roiling tension sat under the pleasant-seeming surface. Whatever it is that keeps them together, or has driven them apart, sits over their interactions, and their home, like an oil slick on boiling water. The plot – well, there’s surprises in every word. If we come to the story knowing nothing, then the gradual reveals on all sides, the gentle unmasking of hard truth, and the potential for appalling consequences – are all guaranteed to leave us a little wiser when we walk away from the book. It’s a slow burner, this one, but the build up is deliciously clever, each disclosure cloaking even further mysteries – leaving the reader crouched over the text in anticipation, trying to work out where the next twist is going to take us. This is definitely worth picking up, if you’re in the mood for an incredibly well realised psychological thriller, with the odd element suggesting all may not be quite as it appears. I tore through it quickly, and I can say that it delivers on its early promise – each turn of phrase an emotional punch to the gut, each page a revelation. 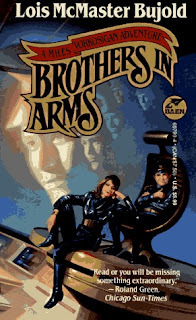 Brothers In Arms is a novel in Lois McMaster Bujold’s extensive “Vorkosigan Saga” sci-fi series. I’ve been working my way back through the series this year, and in large part, it’s been as good as I recall. The majority of the text takes place on Earth, which hasn’t really turned up in the series before now. Rather than Compared to the exotic allure of the Cetagandan Empire in the previous volume, Earth feels at once more prosaic, more familiar – and distinctly different to the worlds we’ve visited before. This is a world of embassies, of diplomatic overtures and quiet, dignified assasinations. Here, it seems, is the place to be if you need to do some really good shopping – from living clothes to starships. Earth is an amalgamation of cultures, drawing in influences from everywhere around it. Admittedly, the reader is limited, largely, to shopping centres and embassy compounds – but seeing the allies and enemies of the previous books left dealing with each other across a third party is intriguing. Both Barrayarans and Cetagandans are keen to avoid a war – but can’t resist doing a bit of back-handed blackmail, violence and occasional diplomacy at the same time. There’s the feeling of a cold war conflict coursing through the setting, reminiscent of classics like The Third Man – with a fair degree of cloak and dagger antics on display (or not, as the case may be). Miles is conflicted, perhaps more than ever. After some time spent with his mercenary troops, he’s back under the government’s thumb, trying to explain why, amongst other things, he needs quite so much money. He’s thoroughly energetic, but still caught in the desire to make something of himself, to be something – if he can work out what that is. To live up to his famous parents, to have access to power, to change the universe – these are all things that can be done by Miles as a mercenary admiral, but perhaps not as Miles Vorkosigan, Barrayaran junior officer. On the other hand, the Vorkosigan name is at the core of Miles’ self-belief – he struggles to match up to the examples he would have to renounce in order to match. It’s taking its toll here, as he sometimes drifts toweard being subtly schizophrenic, a man not entirely sure who he is, but also not certain who it is he would like to be. He’s backed up here by the long-suffering Ivan, who is determined to avoid as much of Miles’ shenanigans as possible. Ivan remains a delightful straight man in the face of Miles’ mania –and an excellent contrast for the reader. They’re joined by the eternally competent Elli Quinn (fresh from her role in Ethan of Athos). Elli remains straightforward, honest, and with a streak of ruthlessness against her enemies. Between them, she and Ivan make unlikely but effective body-men for Miles, who uses them both unapologetically and effectively – though with a degree of affection on all sides. They’re faced by a string of antagonists – though I’ll leave exactly who they are and what their goals are out of this review, for the sake of spoilers. That said, Bujold has pulled out the stops to provide a cool, calculating antagonist with a long term view, and a willingness to use harsh and outright lethal approaches to get what they want. There are some more sympathetic characters on this side of the line as well, and a few that seem to straddle the space between allies and enemies for Miles. Quite whom to trust, and what their end goals actually are, remains somewhat shrouded, even to the last. On that basis, the plot rockets along rather nicely. There’s a brief lull at the start, as we’re brought up to speed and introduced to the world, but quite soon there’s what feels like a myriad of plots being juggled – and a steadily ratcheting tension, as Miles tries to work out what’s going on, and why it’s happening quite so explosively. This one is largely a slow burner, an investigation into hidden secrets – and a character study, with some top notch dialogue between Miles and his foes, which reveals quite a lot about both sides in the process. Is it worth reading? If you’re invested in the Vorkosigan saga to this point then I’d say yes, it’s worth your time. If you’re coming to it new, there’s perhaps a little too much assumed knowledge to make for a straightforward read. It’s still a decent standalone novel, but it really should be read after the works which precede it.